If record signing Andre Gray is ruled out against Reading, Clarets boss Sean Dyche is happy with his strength in depth in the striking department. Gray has been described as “touch and go” by Dyche after being forced off at Derby with a hamstring problem on Monday night. Rouwen Hennings came on in his place, while Chris Long is also available, and Dyche said: “I think Rouwen and Longy have done well, they’ve been sitting behind the scene, they’ve got much fitter than they were when they first game in. “Longy had a strange pre-season, which we knew about, and Rouwen had come from a different culture and a different pace to the game and I think they’ve adapted well. All three, including Gray put in extra fitness work in the last international break, and Dyche feels that has been crucial: “There was a group with Joey, Rouwen, Longy and Andre who were all people behind our norms so the idea was to get them to at least our norms, then as they play more obviously true match fitness and sharpness continues to grow. 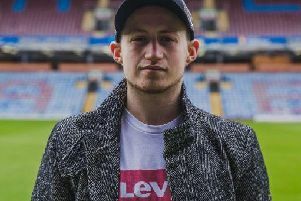 Hennings is adapting from the German game, having signed from Bundesliga 2 side Karlsruher SC, but Dyche is happy with his progress: “He’s adapting to a different way of playing, not just from our format but the way the Championship is. “He’s showing good signs of it and there have been real strong glimpses of it in games and that can only continue to grow the more he trains with us, the more he plays with us and the better understanding he gets with how the Championship operates. “In Bundesliga 2 there are some really big clubs, a bit like our Championship. “It’s like any division there’ll be some big clubs, some middle clubs and some smaller clubs. Any division more or less worldwide is like that. “There’s no definition of how level they are in terms of understanding how the football operates. “I don’t think there’s a way of measuring that. “But there’s certainly an adaptation in just the styles, and everything about it. It’s a different culture for your life, it’s a different culture with the training schedules and the way the team operates on a daily basis, then you’ve got the fans, the feeling of the stadiums. It’s all of those things – it’s not just on the pitch but off the pitch. Hennings played with some stellar talent in the Germany Under 21 squad, such as Mesut Ozil, Jerome Boateng, Tony Kroos and Manuel Neuer, and Dyche added: “He’s got a great pedigree from his younger years going through to now. “You go on good recruitment, what your eyes are seeing, you go on information backing that and supporting it and you go on what you see in training and how he’s developing into what we do. “Chris Long is slightly different, he’s got a feeling already. He’s had touches of it on loan and had a few minutes with us and getting used to our group.